These wheels are intended for stationery and swing frame cut-off machines. 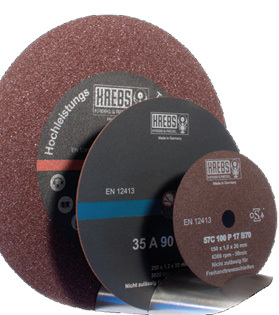 High performance KREBS&RIEDEL cutting wheels are produced for the use in metal and foundry industries. Our offer includes abrasive cut-off wheels for dry or wet cutting and reinforced but also not reinforced wheels which apply to various processes in the industry. In the foundry industry, the wheels serve the purpose of cutting off parts of moulds/casts which can also be polluted with casting/foundry sand. In the metal industry, our wheels apply to cutting of bars, engine valve stems, high alloy pipe, and more. All the enumerated processes require a cutting wheel with wet cutting where heat colouring of the cut off surface of sides or bars is not allowed. Abrasive cutoff wheels are also manufactured for the needs of laboratory samples in metallographic form. Dimensions of the wheel in diameter are from 50 to 800mm and in thickness up to 0.5mm.